Robyn Rihanna Fenty (born February 20, 1988), better known as simply Rihanna, is a Barbadian R&B recording artist and songwriter topping the charts and looking good while doing it! Rihanna is one of the most beautiful and intriguing artists around today, she keeps us captivated with her songs, music, lifestyle and even body art. 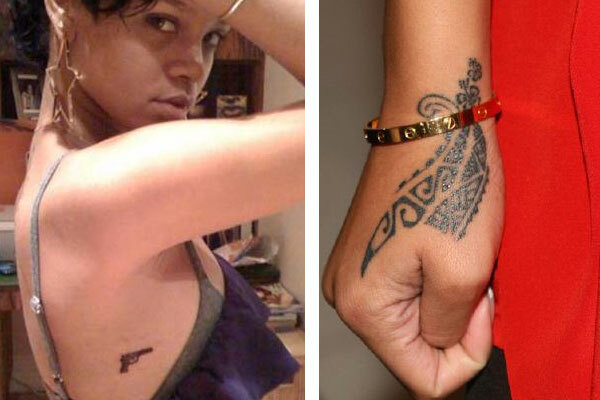 Let’s take a look at the Rhianna’s tattoo transformation from when she just started out as a young songstress to today as an International superstar. So far Rihanna has 15 (maybe 16 depending on a tweet she sent out in Jan 21012 of her getting a back tatt) small tattoos located all over her body from her head down to her ankles. She has even created a tattoo on her own – including a little umbrella on her tattooist arm! 1. & 2. Rihanna started collecting tattoos in 2006 when her career started taking off and she tattooed 2 music notes on her right ankle. The symbol behind her ear is a Pisces Sign and it was done by a famous Brazilian artist who books three years in advance. Luckily for Rihanna he was in Tokyo at the same time so he could create it for her immediately. 3. & 4. Rihanna has a Sanskrit tattoo on her hip that reads Forgiveness, Truth, Repression, Calmness. These are most likely encouraging words that provide support and spiritual strength for Rihanna. She also has a star tattooed on the top inside of her left ear. 5. 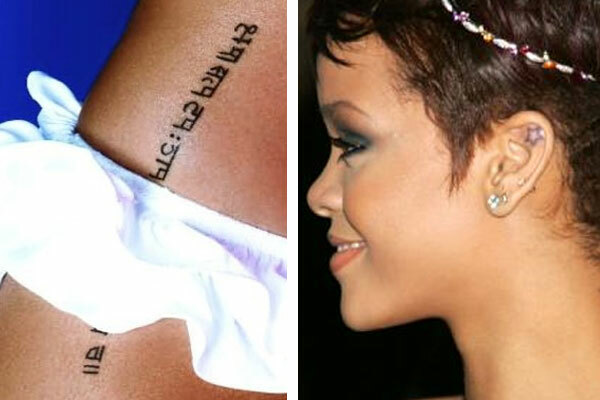 & 6.Rihanna has An Arabic phrase on her ribcage area reading ‘Al Hurria fi Al Maseeh‘ translating into Freedom in God. The tattoo on her left ankle is a cute skull with a bow on its head and it was done during a stay Miami. 7. & 8. 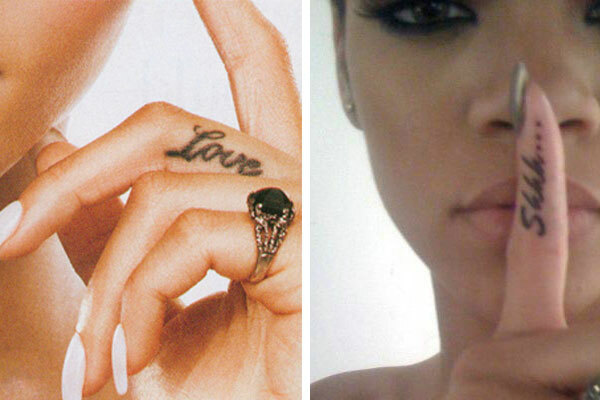 The tattoo on Rihanna’s left middle finger reads “love” which she got from an artist in LA. The “Shhh…” phrase is on her right index finger and has been copied by other celebrities such as Lindsay Lohan and Lily Allen. 9. & 10. 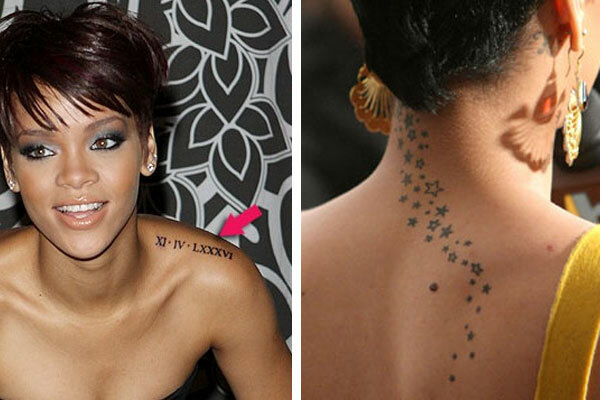 Rihanna has the date April 11 1986 tattooed across her left shoulder in Roman numerals which is the date of her assistant and best friends birthday. She also has a trail of stars going down her back which were started in LA but later added to by artist Bang Bang in New York at a later date. 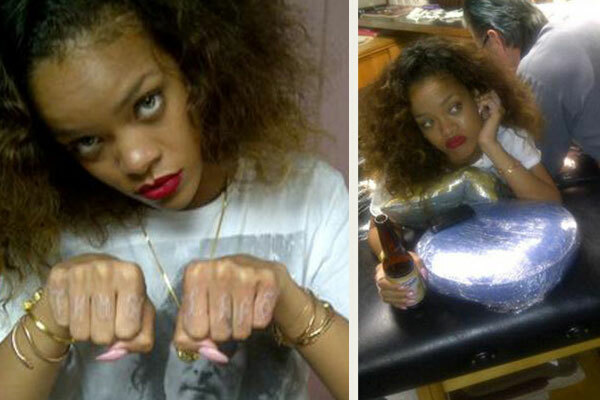 Rihanna’s most current tattoo as of January 2012 is the words Thug Life on her knuckles in what looks like white ink. The words follow the lead of late rapper Tupac ‘2Pac’ Shakur, who had the phrase tattooed on his belly. Rihanna tweeted: “♫ All these b*****s screaming that 2pac back ♫ #THUGLIFE”. Rhianna also posted a picture of herself laying on the artists table getting a tatt on her back, but only time will tell what that ink will reveal! Check back for more updates soon! 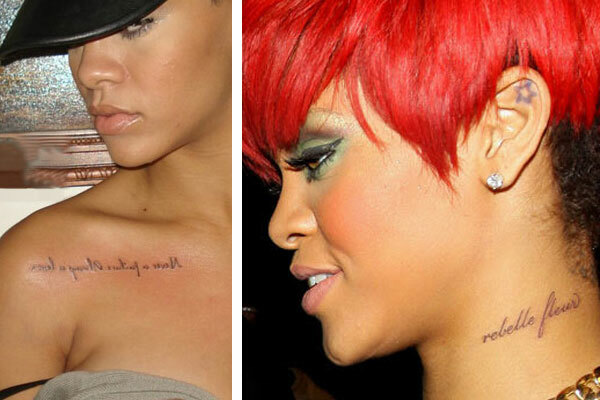 We are sure that this will not be the last we post on Rihanna’s tattoos because this girl loves to alter her identity! What do you think of all this ink? Classy or Trashy? What Does Rihanna look like Without Makeup? Rihanna is a beautiful young woman, who needs little to no help in the looks department. But take a look at her without all the help she gets from makeup. Rihanna is a girl who really likes to switch her look up and often gets tattoos and changes her hair color and cut. 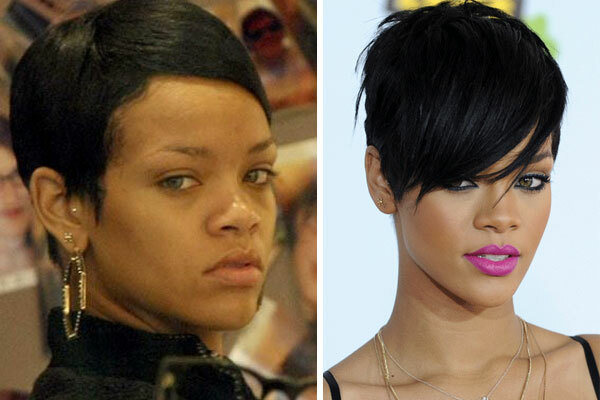 Do you think Rihanna looks better fresh faced, or with a little help from CoverGirl?